Good morning friends! We’re back from a lovely vacation to Presque Isle in Erie, PA. This was basically a recreation of my childhood vacations, because I don’t actually know how to vacation else where, apparently. When we were thinking about doing a trip for our anniversary, naturally the first thing that popped into my head was “We could go up to Erie! That’s what you do for vacations.” Of course then my in-laws decided to do an Lake Erie trip for the family vacation, though over in Port Clinton instead of Presque Isle. I thought perhaps my husband might want to do something else instead of two “beach” trips in one year, but he didn’t say anything about it, so off we went to my childhood. When I was a kid, Presque Isle was a standard vacation with standard activities, for the most part. There was the year we drove up to Niagara Falls for a day, but mostly we hung out on the beach and in the hotel and went to Waldameer Park every year. We could spend a whole day just on the beach. We’d bring a picnic of sandwich stuff and drinks and chips and we’d stay to watch the sun setting over the water before packing up to go home. It’s kind of amazing how much entertainment children can get out of sand and water. When we went up we spent some time on the beach, but mostly we biked around it. We never biked up at Presque Isle when we were little. I guess we never thought about bringing bikes up until we were there, and we biked everywhere else, so it wasn’t that exciting for us back then. Now we don’t have a means of biking, really, so Logan and I rented bikes Friday and Saturday and biked around the peninsula. It was really nice. 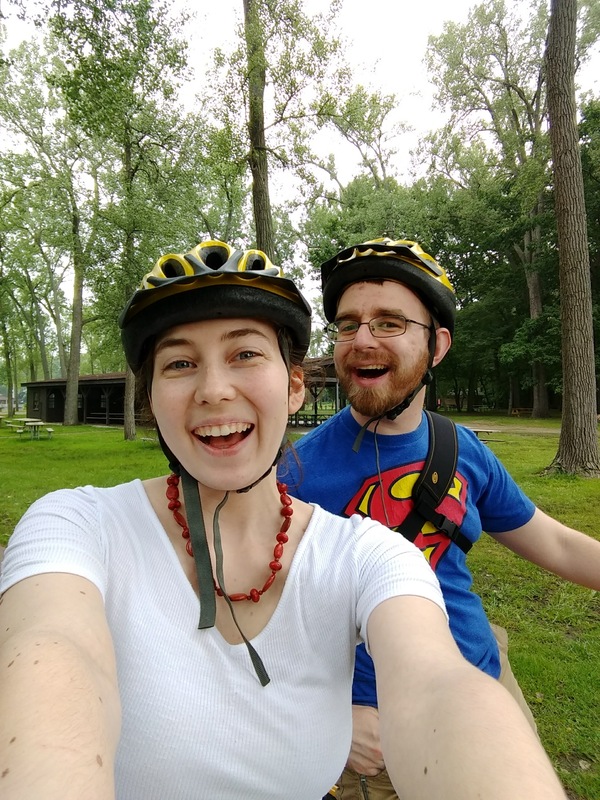 Neither of us have done much biking since we were kids. I biked back and forth from the theater in college, but that was a couple blocks both ways while the weather permitted. It was actually really nice to be on a bike again, and one that had real breaks. They were back-peddle breaks, which was weird. I haven’t been on a back-peddle bike since I was wee little, but they were good bikes and we had a good time. 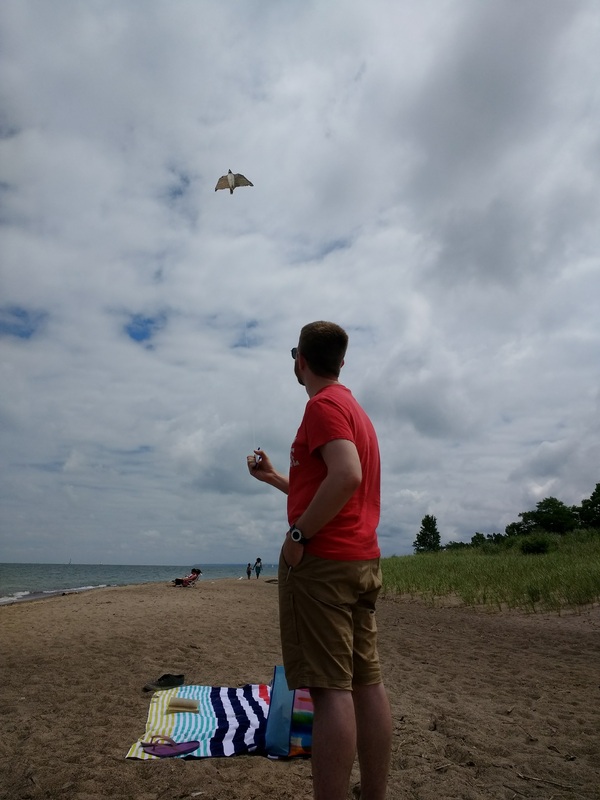 We flew a kite on the beach. We didn’t do that when we were little either. Logan had never flown a kite before, which I think is crazy. We had a big field beside our house growing up that we’d fly kites in all the time with my dad. Not on the beach, though, which seems silly because the wind is excellent on the beach. There’s a beach specifically for kite flying between beaches nine and ten. Logan and I went and saw all the other kites and flew our falcon shaped one for a long time. He kept escaping from me, though, and I got tired of chasing after him and handed him off to Logan to look after. The wind was so strong that day that we didn’t have to run to get the kite up, we just lifted him up and let him go and off he went. He kept flying even after we’d reeled him in. When I was a kid on vacation, my family would generally find chain restaurants to eat at. It was easier with three small kids to just go to the familiar place where you know they’ll eat something. Cracker Barrel was sort of an exception, since we didn’t have one at home, but it’s still a chain place, just a really cool chain place. We loved going to Cracker Barrel on vacation, it was super exciting and fun. Logan’s childhood dining experiences were different. His family is super into trying local food places and new things. Logan and his sisters would eat pretty much anything as kids, so there was less risk in trying different places. A big part of his family vacations was the food experience. Their standard was Ocean City, MD and it was highlighted with restaurants. Logan told me all about the place with the really good crab cakes and nothing else. Apparently everything else was mediocre at best, but the crab cakes were so good that they had to go every year regardless. So for our vacation we branched out and tried some local places near Presque Isle. We went to a little place on the water called JRs on the Bay, or The Sloppy Duck, still not sure which, exactly. The Sloppy Duck was what appeared on Google, but the sign said JRs on the Bay, too. Either way, it was very good. They had really good french fries, and I very much enjoyed the half of the burger I managed to eat. It was a 1/2 pound burger and I am a tiny human. We did Cracker Barrel for dinner, because tradition, and IHOP for a convenient breakfast on Saturday, but began our local food search anew for dinner before heading home. We found the best pizza place. They did pizza customized by the slice. So you could get three slices of pizza, one pepperoni, one bacon and ricotta, and one jalapenos and anchovies, if you wanted. I would warn, though, that if those jalapenos touch any other slice, that slice is contaminated and will burn your mouth. Logan and I got three slices each. He got three different toppings on his, I got two chicken, bacon, ranch slices and one with ricotta and spinach. They were all really good. Logan got a buffalo chicken slice and he said it may have been better than Pizza Joe’s, which is the highest praise possible. Pizza Joe’s buffalo chicken pizza has been one of his favorites forever. The only sad part about our pizza experiences is that it’s only in Erie, two and a half hours away. While our vacation wasn’t exactly like my childhood adventures, it was still a very good vacation. I was a little disappointed we didn’t have time to go to Waldameer. It’s not the biggest amusement park in the world, it doesn’t have any overly impressive rides, but driving past it all lit up after dark, with the Ferris Wheel going and the swings twirling I could almost hear the music in my head. It’s one of those things you long for, even though you know it’d probably be disappointing to see a big place turned small by perspective. Maybe next time. Despite that, I loved melding our childhood vacations together. I loved making new memories and seeing new things with my husband. We had a really good time and I can’t wait to do it again.